Children’s lives are saved every day thanks to the hard work and dedication of children’s hospitals all over the country. Children’s hospitals have a huge impact on the lives of so many children who, without their help and care, would not be able to live life to the fullest. This is why it is so important to support these hospitals in any way possible. Extra Life is a way to do just that! Extra Life is a fundraising campaign to earn money for hospitals in the Children’s Miracle Network. 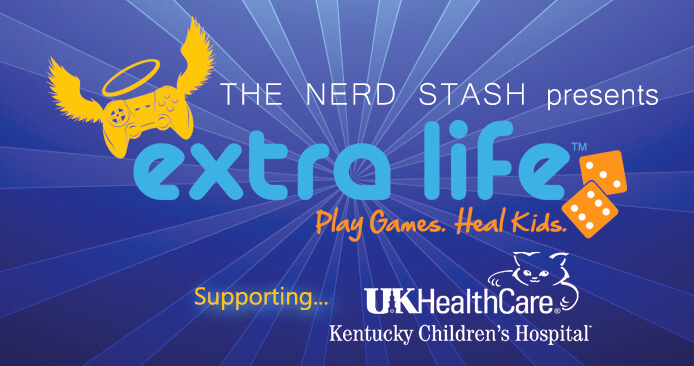 The Nerd Stash has chosen to raise money for the Kentucky Children’s Hospital. There is more than one way to get involved. The first and easiest way is to participate in our marathons that occur throughout the year. You can watch our live streams daily on our Twitch channel where you can watch the participants play video games, do crafts, speedruns, and much more to raise money for this cause. It should be fun chatting with each other and watching games. You can also help by supporting Extra Life and our team through donations on our team page. All donations are tax-deductible and every penny goes to The Kentucky Children’s Hospital! Last year, the Extra Life Drive raised more than 9 million dollars for children’s hospitals far and wide, and this year is gearing up to be more successful than before! Want more information on the Extra Life charity? Then check out the story of Victoria Enmon, her battle with Leukemia, and the charity that formed from it all. The Nerd Stash Team streams live daily and you can watch them on Our Twitch channel as we play video games and offer so much more for you to engage and be a part of. Click on the logo to visit and follow our channel! Look for upcoming announcements about prizes and loot that The Nerd Stash will be giving away and be auctioning off during our Marathons that are held throughout the entire year. More details to come!